Shortcut digital tasks with a flick of this Bluetooth button. Program Flic Button to perform virtually any virtual task, from location sharing to alarm snoozing. Instead of having to go through several motions on your phone, you can designate up to three commands into one button (e.g., one click: play/pause music, two clicks: call mom, and hold: order an Uber). 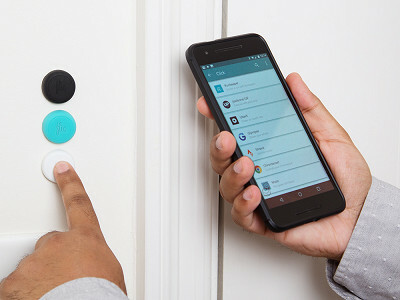 You can use the adhesive on the back of the button to keep it somewhere handy, like near the front door, by your bed, even by your car dashboard. This is perfect for controlling all things smart (think: blinds, thermostat, lights) when you get home or you’re going to bed. If you take a close look at your routine, we’re sure you’ll find plenty of opportunities to turn longer, digital tasks into a short push of the button. What is my Flic’s battery life? We have optimized the battery life to last as long as possible. For most use-cases it will last up to one year or more. Flic also has a replaceable battery. To change the battery, stick your Flic to a flat surface. Gripping the silicon edges, gently screw the upper housing of the Flic counter clockwise. You’ll then be able to lift the top off and replace the battery with a regular coin cell battery (CR2016). How do I trigger my Flic? Flic connects to a smartphone (both iOS and Android) or tablet. When flic is pressed, it uses the device to activate a function predefined by the user. This function can either be something directly on the device – such as make a loud sound so the user can find it – or something else such as turning on a light or starting music on the stereo. How many functions can I predefine my Flic with? You can define different actions for Click, Double Click and Hold. There is no limit to how many things can happen at once when you press Flic. All actions are easily changed in the Flic app. How does my Flic work? Flic uses Bluetooth Low-energy (BLE) to communicate with your smartphone. What is the range of my Flic? Flic works up to 150 feet (50 meters) away from your device/smartphone. How do I attach my Flic to a surface? Flic comes with a double sided adhesive so you can stick it to any surface. If it gets dirty, just wash it with soap and it will be good as new. Flic’s battery hatch can also be exchanged to one with a clip-on (so you can wear Flic). Flic is also weather-proof. It has been tested against the IP44 class. How many Flics can I have on one device? This depends a little on the phone or tablet that you are using and on how you set up your Flics. Generally, you can have up to 10 Flics connected at the same time, say in your home. But then you can have 10 more in your car, and 10 more in your office. If you use other Bluetooth devices such as headsets, speakers or wearables, these connections may decrease the amount of Flics you can use at the same time. How is my Flic different from a NFC-tag? With NFC you always have to have the smartphone in your hand and scan your tags, considering that you scan it right and don’t have to rescan it. A lot of people don’t find NFC tags easy enough to use them in their everyday life. With Flic on the other hand you can launch your actions with a simple press of a button, as long as the smartphone is somewhere nearby. The button interface is simple enough for (almost) everyone. Hello fans of Grommet! I’m Daniel Abdiu, Chief Operating Officer at Shortcut Labs. I’m happy to finally show you the simplicity of Flic, the smart button that will make your life simpler and more convenient. For example, just imagine waking up in the morning and with just a push of a button you snooze your alarm, start your morning music, and turn on the lights. I look forward to share more information with you all, and hear any feedback or questions you might have. Is this for iPhone or Android? Thanks! @Eric Hi Eric, you can use it both on iPhone (iOS 9 or later) and on Android (Version 4.4 or later). You can even connect the buttons to a Mac computer (Sierra MacOS or later). Is it possible to program Flic to start Siri on an iPhone? It would need to simulate a press & hold of the iPhone's 'home' button. How long do the batteries typically last? Is it an amount of clicks or a duration of time? Thanks! Hello Tory, thank you for your question, it all depends on usage of course but it could last up to 18 months. It is a combination of clicks and duration of time and number of connections made. The good thing is that it is very easy to replace the battery since it’s just a coin cell battery (CR2016) so it is very cheap to buy a new battery to get new power to the Flic button. Shortcut digital tasks with a flick of this Bluetooth button. 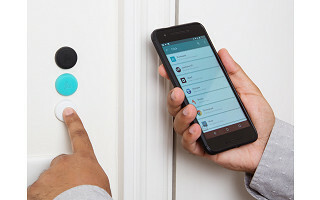 Program Flic Button to perform virtually any virtual task, from location sharing to alarm snoozing. Instead of having to go through several motions on your phone, you can designate up to three commands into one button (e.g., one click: play/pause music, two clicks: call mom, and hold: order an Uber). 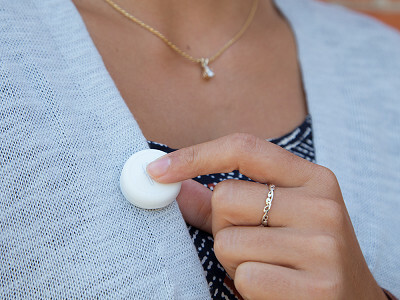 You can use the adhesive on the back of the button to keep it somewhere handy, like near the front door, by your bed, even by your car dashboard. 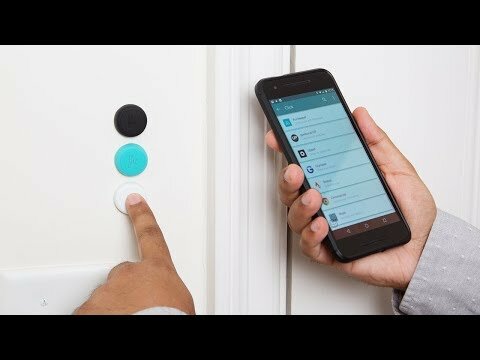 This is perfect for controlling all things smart (think: blinds, thermostat, lights) when you get home or you’re going to bed.